[By Nick, Limited Edition for 2013] At the beginning of the year, Dubba and I made predictions for what this year would be like in the ice cream world. My prediction was that there would be more fruity flavors. Well Skinny Cow is here to support my prediction with their new limited edition Chocolate Covered Cherry Cones. 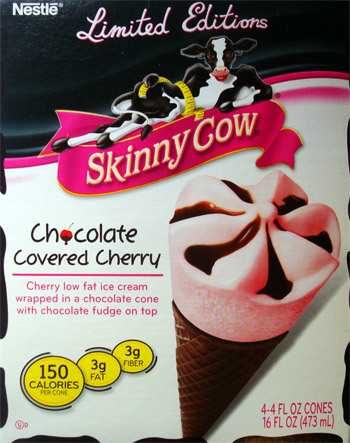 I have to commend Skinny Cow for venturing into the severely neglected cherry ice cream novelty market. Besides the Ben & Jerry's Cherry Garcia bar, no other product seems to come to mind. Coming from a cherry lover, that is just a complete injustice. Strawberry has had its turn to rule long enough! It’s time for a revolution, a very red revolution... Settle down Nick, you have ice cream to review. This year they decided to ditch the whole “slimited” branding in favor of plain old limited branding. I thought slimited was actually a brilliant marketing point while Dubba thought it was a joke. Also, unlike last year’s Mmmmocha truffle bars, there’s nothing demasculinizing on the box this time. Really the only thing of note on the box is that there’s a cute little ice cream cone upc code. I’m not sure if this is on all of their packages but I thought it was a unique touch. Out of the wrapper, it definitely looks appetizing. Heck, it looks almost exactly like it does on the box. Well, it tastes just as good as it looks. The texture is very light; you obviously know you’re not eating a full fat ice cream. It seemed to melt a bit faster than your average skinny cow product. That’s fine because the flavor makes up for the textural flaws. The cherry flavor isn’t intense by any means but it tastes very natural. You don’t get any of that artificial funk often associated with fruit flavors. The fudge doesn’t permeate into the ice cream and what you see around the top is all you get. I think that was a smart idea because it’s very sweet and tends to overpower the cherry flavor from time to time. When you get a nice balance of the ice cream and the fudge, the taste is exceptional especially for a low calorie novelty. The trouble I’ve had with Skinny Cow cones in the past is that they tend to get soggy. Well that’s not the case here. The chocolate cone is fresh and as crunchy as can be. Seeing as I’m trying these at the beginning of their distribution your mileage might vary but the chocolate cone is one of the best I’ve had flavor/texture wise. It has more of an oreo wafer kind of bitterness going on which I enjoy. My only problem with this cone is the promise of a chocolate nugget at the bottom like a drumstick. This “nugget” is more of a pebble in comparison. It’s really not even all that noticeable unless you were to dissect the cone to see if it’s in fact there. This is a “diet” treat though so I guess it saves calories. Still, if this novelty transitions to the normal line up and the chocolate cones maintain their freshness, I can see Skinny Cow having a winner on their hands for years to come. This is by far my favorite Skinny Cow product. Luv that chocolate cone! But I was disappointed in the cherry ice cream which needs a fresh fruit flavor. I wish you could sell the chocolate cones by the box without the ice cream. 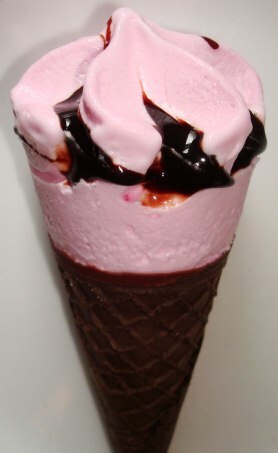 I must confess-- I am not an ice cream lover--except--for a good cherry chocolate flavor. Kudos to Skinny Cow for this low calorie treat. Keep the chocolate,I say, also on other low calorie ice cream novelties.